Are your looking for some great gift ideas for a senior? Creating a gift basket is one of the best ways to show someone how much you care about them. Especially for seniors who have a hard time getting out to shop and have limited resources. Making your own gift basket allows you to personalize it for the recipient and add useful and unique items. They are both fun to give and fun to receive. Here are 12 gift basket ideas for senior citizens that will be cherished. First, you will need a container/basket for your gifts. This can be something recycled or purchased new. A few choices that work well are weaved basket, plastic container, tote bags or just a nice gift bag. The dollar store has a large variety of things that could work for your basket. Use tissue paper or newspaper for your filler material. Avoid using small. messy papers like Easter grass. This basket is hardest to fill because it represents a loss, but at the same time will help keep memories alive. Improve the daily life of a person who has memory loss. Some of the things that are often hard to remember are what day, month and year it is. 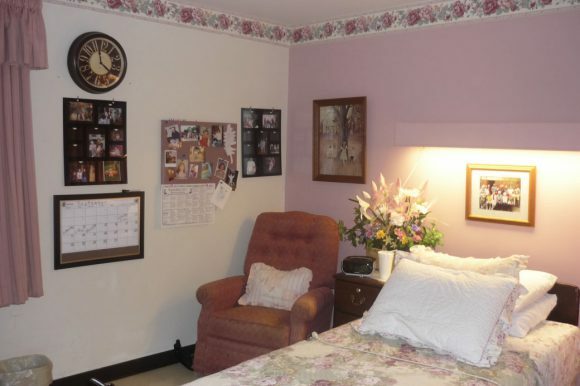 Wall clocks with large letters mounted on a wall where your loved one will see it throughout the day is a huge benefit to someone with memory loss. Another item that I like to give a person with memory loss is a simple easy to use remote control for their TV. On – Off with favorite channels programmed. Create a simple photo album with photos of family and friends but include their names so the person who is losing their memory will be able to remember names and special events. Photo album books can be created online and printed. Everyone dreams of the luxury of waking up and having breakfast ready to eat. Fill a basket full of tasty goodies. Cookies, muffins, juice boxes, fresh fruit and some special flavors of coffee or tea. Add a new personalized coffee mug that is easy to hold handle. Include a few small single servings of cereal that can be eaten as a snack or with their favorite fruit. Why not give the gift of pampering. Fill a basket with low PH soap such as Basis. Avoid scented items which can have a negative effect on some people. Add a fun magazine filled with fun things to read. Battery operated candles. A gift certificate to their favorite salon. Add a few personalized gift certificates. Such as clean their refrigerator, take them shopping or just go on a special outing. Many older people grew up writing letters, greeting cards and thank you notes to those they cared about. In this day of technology, this form of communication is going by the wayside but is still cherished by many. Surprise your loved one with a basket of stationary, greeting cards, stamps, pens and portable writing table. For that special touch, add an address book with friends and relatives addresses written in large text or some computer-generated address labels. Consider including a few large easy to use pens. Create a basket filled with fun. Select some oldies but goodies for your favorite person to enjoy. “Gone with the wind was popular in the 30’s and is still a favorite of many. A few ready made bags of popcorn with a box of Good n Plenty will bring memories of being at the movies. If you choose a sad movie – don’t forget to include a few tissues. For a special touch add a subscription to Netflix or Amazon Prime. Music is a source of entertainment that is enjoyed by all. CD’s make great gifts for those who use CD players. Some CD players are alarm clocks so you can set the alarm to wake to wonderful music or just set the alarm to play music when it is time for dinner. If your senior is a little more tech savvy add an iPod shuffle filled with their favorite songs. Puzzles keep our minds active and provide entertainment for hours. Create a basket filled with puzzles. Soduko and Wordsearch puzzles keep a mind active. Choose large print puzzles for those who have trouble reading. Create your own word search puzzles here. Print and place in a nice binder or on a clipboard. Crossword Puzzles keep your mind sharp. They also help create conversation by asking others what the answer could be. Don’t forget an old fashioned board puzzles. Many seniors still enjoy putting together the pieces of a board puzzle. If reading is on your to-do list this basic is sure to please. Many books come in large print so take advantage of what is available. Books on tape are popular with those who site is diminishing. Large Print Bible for daily devotion. Wednesday night bingo at the lodge is a favorite place for many seniors. Create a tote that can be carried to bingo night that would include markers. Flowers bring beauty and joy to one’s environment. They do not always have to be fresh. A bouquet of silk flowers last forever and can be enjoyed for years. Ask them what their favorite flower is and then try to find a bouquet that will last forever. These baskets are a great way to decorate a nursing home room. As people age, they find that their sight changes. Fill a basket with items made especially for low vision. A few ideas to include are low vision playing cards, large print books, magazines, and puzzles. A handheld magnifying glass will surely be welcomed. You may not consider this a basket but a tote that attaches to a walker-rollator can make a world of difference to a senior. They come in all sizes, shapes, and styles that easily attach to a walker. Fill the tote with daily essentials that are always needed. Such as a small kleenex box, water bottle, paper tablet and pen, phone case, eyeglass case and a key ring These totes are made for both men and women. Why not create a monthly care package specifically designed for someone you love. Take the ideas below and plan to fill a basket each month and either send or take along on your monthly visits. Create a list of 12 basket ideas and throughout the year pick up the supplies to fill them. If a monthly basket seems like too much than just choose a few for special occasions and holidays.